The Thermo Matrix Electronic Multichannel Pipettes offer easy to use, flexible and customizable multichannel pipetting with digital precision. This digital pipette can chain functions together, and will hold up to 5 programs with 40 steps each in memory, even if you should remove the battery. This multichannel pipette also has a scratch pad function for changes on the fly, for use that can be tailored to best and most effectively suit your needs. The matrix pipette line are comfortable to use and hold, with a trigger set up rather than a piston, keeping the thumb from straining from repeated use. This pipette package comes with a broad range of size and tip configuration with several expandable tip options. The electronic pipettes with the extendable range are simple to adjust, with a twist of the handle at the base, the spacing can move to fit nearly any plate or vessel to help boost efficiency. Programming these electronic pipettes is simple with most used function buttons present on the key pad, and when you need more advanced functions a second menu can be activated by pressing a pipette tip into the hole below the up down button. This allows you access to functions like pipette speed, paced dispensing, calibrations, and even adjusting the volume of alerts. The included stand is not a charging stand. The adapter can only be used one at a time. 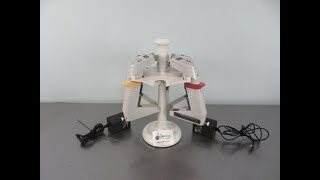 This Thermo Matrix Electronic Multichannel Pipette Set has been fully inspected and is operating without issue. All of our lab equipment comes backed with our standard warranty. Should you have any questions, or need diffent pipettes, just let us know, we're here to help!